Venom is a thriller action movie about a mother and daughter who are met with back luck at every turn. Helen Pace (mother) played by Jessica Morris and Lily Pace (daughter) played by Oliviah Crawford take a trip to the desert after Helen finds out her husband is cheating on her. While taking a turn at an outlook, she runs over a snake and trouble never stops from there. 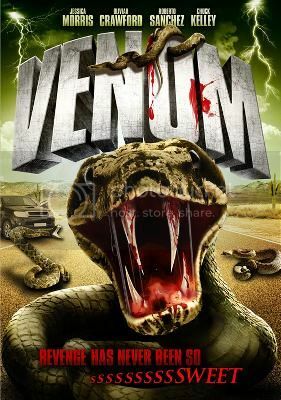 Helen gets bitten by a snake and the car unluckily breaks down, leaving her and Lily to wander around the desert being chased by snakes that are out for revenge. Their problems get even bigger when they run into a drug deal gone bad. Snakes, sand, and drug dealers, will these ladies catch a break or will they perish in the desert? The flick centers on Jessica Morris and her struggles with her cheating husband, overcoming her drug addiction, and patching up her relationship with her daughter, Lily. Morris played the role of a young mother who has yet to learn the ropes of adulthood. Although not much of her past is revealed in the movie, you can see that Morris portrayed Helen as best as she could--in fact she sells the role. The hardships the pair face in the desert creates a bond between the pair that no therapy can achieve. With snakes out for blood and every other dilemma ahead of Helen and Lily, “Venom” will keep you at the edge of your seat. If you’re looking for a thrilling drama, you can watch free movies online just like this one. There are loads of movies in store for you to enjoy, so start your movie streaming marathon today!